The highly detailed bone and resin study. The 92.5% silver then applied over the bone and resin to produce an exquisite finish. 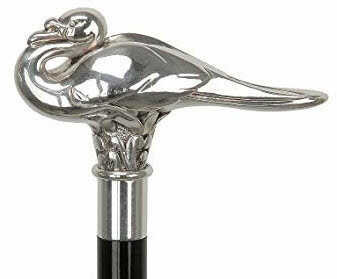 A cane that oozes the Agatha Christie's fictional detective Hercule Poirot. The hand finished study mounted on a beautiful highly polished black hardwood shaft, ending in a fixed brass ferrule. This cane is designed for collection or dress use and should not be used as an every day support / disability aid. The study is prone to damaged if dropped.